Many women suffer from symptoms of anxiety during the menopause transition, which involves feeling dread and worry for a prolonged time, either without a reason or more strongly than reasonable. 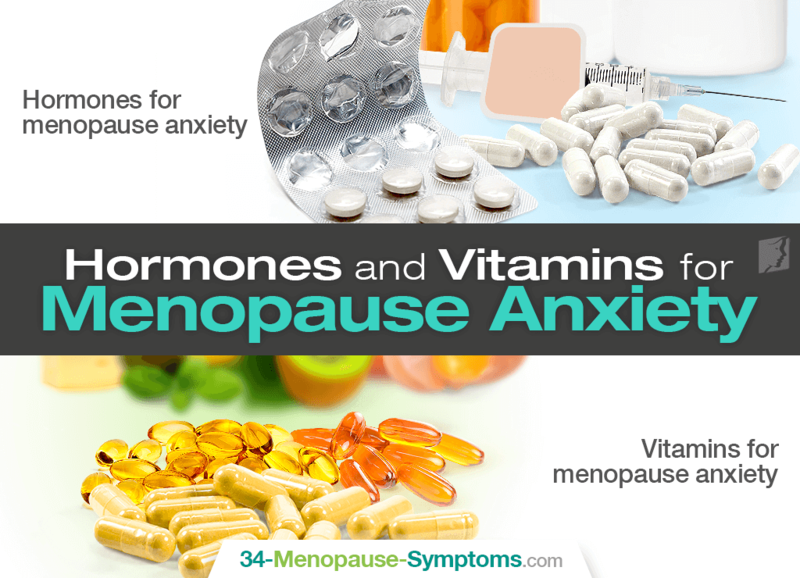 Luckily, there are hormones and vitamins for perimenopause anxiety widely available. Keep reading about hormones and vitamins for menopause anxiety in addition to other methods for a less worrisome life. Most menopausal symptoms are caused by drastically fluctuating and declining estrogen levels, which can, in turn, imbalance other chemicals in the brain, making you more susceptible to anxiety or changes in mood. As such, one of the most commonly prescribed hormones is estrogen in hormone replacement therapy (HRT) for anxiety. However, women who are taking estrogen HRT for menopause anxiety should do so alongside progesterone to decrease the risk of developing breast cancer, uterine cancer, blood clots, and other serious side effects. B vitamins. The B-complex vitamins support the health of the adrenal glands to reduce stress, stabilize depressive moods, and balance out anxiety that can occur in women alongside premenstrual syndrome (PMS). Vitamin A. This antioxidant has been scientifically researched and found to help manage symptoms of anxiety in women. Antioxidants are also well known to battle oxidative stress, which may trigger neuropsychological disorders. Vitamin C. Also known as ascorbic acid, the antioxidant vitamin C plays an instrumental role in preventing and reducing symptoms of stress, depression, anxiety, and fatigue. Vitamin E. This antioxidant's deficiency has been found to increase anxiety-like behavior, and adequate amounts of vitamin E have also been shown to prevent depression. Reduce stress. Anxiety is a reaction to stress. As such, one of the best ways to manage the symptom is by practicing stress-relief techniques - such as yoga, meditation, deep breathing practices, etc. - or doing a hobby or activity that you enjoy to unwind. Be active. Some studies show that exercising can work as well as medication to combat symptoms of anxiety. While 150 minutes of weekly physical activity is recommended, even just 10 minutes a day of walks outside can help clear the mind some. Seek support. Stress and anxiety can accumulate and be made worse if you bottle up your emotions. Make sure you talk to people if you're feeling uncomfortable, and be honest and open about your struggles with your close friends so they can help you through it. However, because hormonal imbalance is the primary cause of anxiety during menopause, resolving this imbalance is the key to treating the anxiety. Find out how to find lasting relief and mood stability through effective anxiety treatments by clicking on the previous link.